In the mid-nineteenth century, the ideal feminine figure was an hourglass above a broad base of full skirts. Wide skirts, which made the waist look smaller and were thought to give women dignity and grace, were supported by layers of petticoats, some made of crinoline, a stiff fabric woven from horsehair (the name derives from the French crin, horsehair, and lin, linen). Crinoline, however, was expensive, heavy, crushable, easily soiled, and could not be cleaned. To enable women's skirts to become as immense as fashion desired, a more effective skirt support was needed. Petticoats were distended with cane and whalebone-and even with inflated rubber tubes-but with limited success. In 1856, a new support was introduced, made of graduated, flexible sprung-steel rings suspended from cloth tapes. The names for these structures included "hoopskirts," "steel skirts," and "skeleton skirts"; they were also called "crinolines," since, confusingly, this term was applied to all skirt expanders, and sometimes referred to as "cage crinolines" or "cages." Indeed, some have perceived hoopskirts as cages imprisoning women. The hindrance of hoops reflected the ideal, cloistered social role of women of the time, who were, as a male commentator in Godey's Lady's Book of August 1865 (p. 265) put it, "unfitted by nature and constitution to move easily or feel in their place in the bustle of crowds and the stir of active out-door life." To many Victorian women, however, hoopskirts promoted "a free and graceful carriage" and were hailed as a blessing. In contrast to numerous hot and heavy petticoats, hoopskirts were lightweight, modest, healthful, economical, and comfortable. Hoopskirts were a marvel of contemporary technology and manufacturing, with many possible variations in construction. Most hoopskirts were made using tempered sprung steel, which had an incredible ability to return to shape. This was rolled into thin sheets, cut into narrow widths, and then closely covered in cotton tubular braid finished with sizing to give a smooth surface. To make a hoop, a length was cut and the ends secured, usually with a small piece of crimped metal. Graduated hoops were then arranged on a frame in the desired shape and suspended from cotton tapes, secured either by metal studs or put through specially made double-woven pockets in the tapes. At the top, partial hoops left an opening over the stomach so the hoop could be put on and secured by a buckled waistband. The entire hoop weighed a mere eight ounces to less than two pounds. The large skirt supports of earlier centuries, such as the Elizabethan farthingale and the eighteenth-century pannier, had been the preserve of the upper classes; by the mid-nineteenth century, however, more women could participate in fashion. Middle-class women and even maids and factory girls now sported hoopskirts, although their cheaper versions had twelve or fewer hoops while more expensive models with twenty to forty hoops gave a smoother line. The pretensions of the "lower orders" was one of the many aspects of hoops that inspired caricaturists. Also ridiculed-and exaggerated-was the balloon-like appearance of overdressed ladies in immense hoops and flounced skirts. (At the extreme, hoopskirts could be up to four yards in circumference, although three yards or less was more common.) More risqué cartoons highlighted the tendency of springy hoops to fly up revealingly; for modesty's sake, many respectable women now adopted long loose underpants or drawers. The demand for hoopskirts was so great that factories flourished across the United States and Europe. Harper's Weekly of February 19, 1859 (p. 125) claimed that two New York factories each produced 3,000 to 4,000 hoopskirts per day. As production continued to increase throughout the 1860s, the hoopskirt industry employed thousands, consumed vast quantities of raw materials, and utilized the latest technologies. As numerous patent applications show, great ingenuity was applied to creating improved hoop machinery and specialized features. Advertisements touted the superiority of their products and gave them impressive names, such as "Champion," "Ne Plus Ultra," and one brand named after the fashion icon of the time, the French empress Eugénie. During the era of the hoop, skirt silhouettes gradually evolved. The dome-shaped skirts of the 1850s gave way to tapered skirts that flared from waist to hem, so supports were correspondingly smaller on top and often had hoops only below the knee. Hoopskirts similarly responded to the fluctuations of fashionable skirt lengths. When the hoop was first introduced, women's skirts touched or nearly touched the ground, but shorter skirts increasingly became the rage in the 1860s, and skirts also began to be looped up over a shortened underskirt for walking, causing what some claimed was an "unseemly display of ankle." In the same period, trained skirts, dragging nine inches or more on the ground, also became increasingly fashionable; by the mid-1860s hoopskirts were specially designed with extra fullness at the bottom back to gracefully support and keep the train away from the feet. 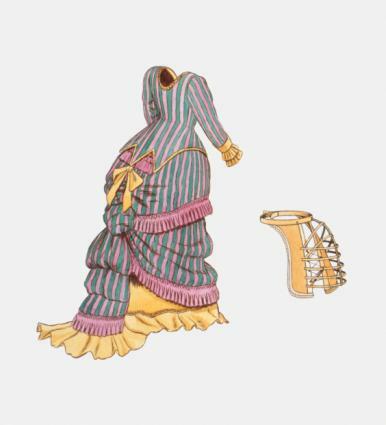 The demise of the hoop skirt was forecast by fashion arbiters from the time of its introduction, yet hoops remained indispensable to most women throughout the 1860s. By the very late 1860s, attention shifted to the back of the skirt and emphasis was on the bustle which now augmented the hoop. As bustles became more pronounced, the hoop was definitively declared out of fashion by the early 1870s. However, even into the 1880s some women wore small hoops-as little as eighteen or even sixteen inches in diameter, which must have been a hindrance when walking-to keep their skirts clear of their legs. Marvels of technology, industry, and ingenuity, hoopskirts perfectly suited the societal and aesthetic needs of their time. In the November 1861 issue of Peterson's Magazine (p. 384), one writer went so far as to declare hoopskirts "a permanent institution, which no caprice of fashion will be likely to wholly destroy." While fashion soon belied this prediction, the hoop did enjoy a remarkably long reign, and stands as the defining garment of its era. In the twentieth century, the hoop skirt was revived under full-skirted evening dresses, or robes de style, in the late 1910s and 1920s and, most famously, as nylon net "crinolines" and featherboned hoopskirts supporting bouffant New Look and 1950s fashions. The recurring popularity of hoopskirted looks for romantic occasions such as weddings continues to keep this extremely feminine fashion alive even into the twenty-first century. Adburgham, Alison. A Punch History of Manners and Modes, 1841-1940. London: Hutchison & Co., 1961. Calzaretta, Bridget. Crinolineomania: Modern Women in Art. Exhibition catalogue. Purchase, N.Y.: Neuberger Museum, 1991. Cunnington, C. Willett. English Women's Clothing in the Nineteenth Century. London: Faber and Faber, 1937 (republished New York: Dover Publications, 1990). Gernsheim, Alison. Fashion and Reality: 1840-1914. London: Faber and Faber, 1963 (republished as Victorian and Edwardian Fashion: A Photographic Survey. New York: Dover Publications, 1981). Severa, Joan. Dressed for the Photographer: Ordinary Americans and Fashion, 1840-1900. Kent, Ohio: Kent State University Press, 1995. Waugh, Norah. Corsets and Crinolines. New York: Theatre Arts Books, 1954.